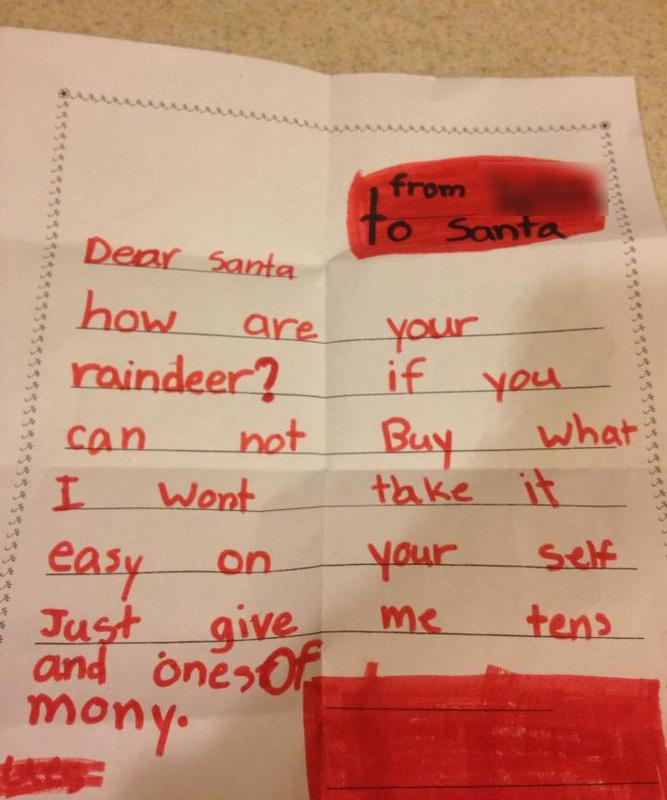 "Your good list is emty, and your life is emty." 1. You think you understand pain, Santa? 2. You can't even make a G.I. Joe jet. Who do you think you are? "You have no idea what you just did. I really tried to believe. Everyone tole me its your parents. I can't believe you anymore. Is the Easter bunny real? How about the tooth fairy, huh? You just ruined a 10-year-old child's LIFE. Thanks. Nothing will make me feel better. You lied to me about something I loved that BROKE my heart. #MiddleFingerEmoji"
4. You think your sleigh is magical? 8. And there are going to be consequences. 9. Also, why are you so fat? 10. Eat your vegetables, dude. 11. Are you even real? "Dear Santa, are you real? How could you go to a bigger city in one night? But I want to know how you do it. If you are real, do you have super magic with your suit? I just want a CD, book Diary of a Wimpy Kid. Good luck, Santa. I will wait for you on Dec 24, 2017, and you are my hero with your magic!!!" "5. How many elves are there? 6. Who is your favorite elf? 7. Why do you wear red? 8. How do I know you are real? Can you prove it? 14. You sit on a throne of lies.